Our flagship product, VizGlow, is a powerful, multi-dimensional software tool for simulating industrial, non-equilibrium plasmas. VizGlow can resolve spatial and time accurate plasma discharges with complex reactor geometries in three dimensions using a parallel simulation framework. 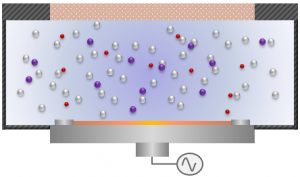 While it is extremely robust, it is not always the best place to start when implementing a new chemistry mechanism or optimizing a plasma process. For these types of problems, we recommend starting with ChemZone. ChemZone is a fast, 0-D reactor simulation tool for finite-rate chemistry mechanism and plasma process development. It is based on a well-stirred assumption in which the reactor is represented by a 0-D control volume with a single value for all discharge parameters. The main benefit of this approach is the very fast execution time. A single VizGlow simulation can take hours to days to complete, while a single ChemZone simulation can be completed in seconds. This allows for rapid evaluation of large parametric spaces, sensitivity studies, and uncertainty analyses for complex chemistries requiring thousands of simulations. And these exhaustive simulation approaches are becoming more relevant as semiconductor patterns shrink and process optimization becomes more challenging. The recommended approach is to first use ChemZone to develop and refine reaction chemistries and explore process sensitivities. Once the mechanism is optimized, VizGlow can be used to spatially resolve the discharge and investigate other performance attributes, such as ion energy and angular distributions at substrates surfaces. This approach improves the accuracy and efficiency of the chemistry mechanism and is ideal for plasma process engineers developing and optimizing reactor processes. 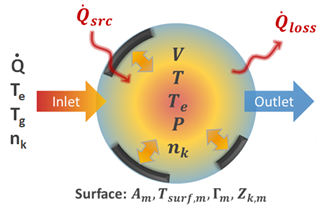 ChemZone simulates the generic reactor configuration shown in Figure 1 using a multi-species, multi-temperature, spatially uniform gas mixture formulation. The configuration includes an inlet port with mixture gas, outlet port, volumetric energy source for bulk gas and electrons, volumetric energy loss, and an arbitrary number of surfaces consisting of different areas, materials, and bias voltages. The governing equations consist of species density, bulk temperature, electron temperature, and surface site fractions. Effects of parameters such as flow residence time, initial species concentrations, and external heat loss can also be captured. Key model outputs include chemical species densities for ions, electrons, neutrals, electron temperature, bulk gas temperature, net species production rates, forward and backward reaction rate coefficients, and contribution of different reactions to the net production of each species. Consider the mechanism evaluation of SF6/O2 plasma chemistry with 35 species and 147 reactions at 25mTorr. Figure 2 shows the transient evolution of dominant charged species and radicals until steady state is reached. F- is the dominant negative species and O2+ is the dominant positive species. The high concentration of negative ions (electronegative plasma) can significantly influence the discharge characteristics and therefore surface processes. Surface biasing or modification to the operating conditions could be used to enhance or suppress negative ion formation. 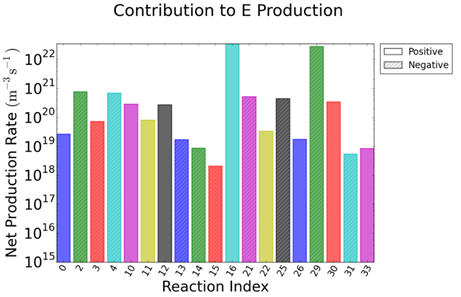 Next, Figure 3 shows the contribution to net electron production rates from all 147 reactions at steady state. From this plot, we are able to identify which specific reactions (reactions 16 and 29) contribute more to the production of electrons. To increase production, constituents contained within those reactions can be modified or increased. Reactions can also be enabled/disabled to explore their effects on the production rates. This can be rapidly evaluated through simulation. Furthermore, the information can be used to design a reduced mechanism. For example, if certain species or reactions are shown to play a negligible role, they can sometimes be excluded from the mechanism. The reduced mechanism can be then used in VizGlow for a full spatially accurate simulation. A reduced mechanism will run much faster than the full mechanism, depending on the total number of reduced species. ChemZone can perform automated sensitivity analyses for reactor quantities of interest, such as species mass fraction, number densities, wall flux, temperature, and pressure. A user may simply check quantities of interest within the graphical user interface to enable them in the sensitivity study. When ChemZone is executed, the solver will systematically perturb the reaction rate coefficient of each reaction and quantify its effect on the mechanism. Continuing with the SF6/O2 example, Figure 4 shows a sensitivity analysis of the one-directional wall flux of SF+ ions to the reaction rate coefficients at the wafer surface. 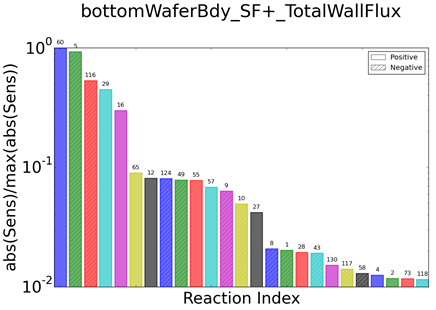 The one-directional wall flux of SF+ is dominated by only a few reactions, while the rest play a negligible role. The first dominant reaction, reaction 5, is the electron impact ionization of SF forming SF+. The second, reaction 60, is the collision exchange between SF and O2+ forming SF+ and O2. These reactions are the dominate factors that create SF+ availability for interacting with the wafer surface. A similar investigation can be performed for any quantity of interest. ChemZone is a fast reactor analysis tool for developing and optimizing chemistry mechanisms and plasma processes. ChemZone can also be used for applications in which the gas is not ionized, such as hydrocarbon combustion in internal combustion engines, gas turbines, and ignition delay timing. The primary benefit of ChemZone is its fast execution, allowing for rapid evaluation of large sensitivity studies, mechanism reductions, forward analyses, and process optimizations. ChemZone is a module within the OverViz Simulation Suite. OverViz is an industrial multiphysics framework for performing hybrid plasma, fluid flow, electromagnetic, particle simulations. For more information, please contact us at info@esgeetech.com.